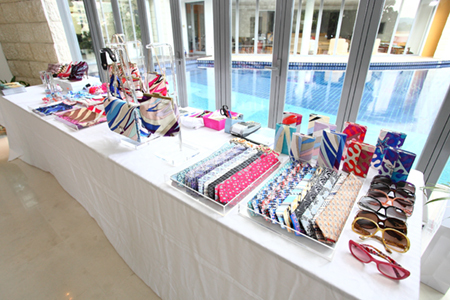 Summer, bold “Italianism” and evolving the body conscious silhouette into a fresh wardrobe for today’s Pucci woman was the theme of a fashion show to benefit the Pistorio Foundation held in January at the residence of HE the Ambassador Folco de Luca Gabrielli and Mrs. Nilou De Luca Gabrielli of Italy. Guests were treated to a vibrant show from Pucci’s Pre-Spring 2010 collection, featuring prints & embroideries inspired by an aquatic palette of blue, pink, yellow, red and sun bleached khaki, with gold and silver accents. Following the show, guests had a private shopping opportunity to buy all the designs shown, as well as additional accessories, and Pucci generously donated a percentage of the sales, nearly SGD 4,000, to the Pistorio Foundation . The event was well-attended by many local fashionistas and expatriate ladies, many of whom are ongoing supporters of the foundation. Many thanks to these wonderfully generous guests, and a special thanks to the Bluebell Group (distributors of Pucci in Singapore and Malaysia), along with our heartfelt appreciation to HE the Ambassador Folco de Luca Gabrielli and Mrs. Nilou De Luca Gabrielli for hosting this fundraiser in their beautiful home. All monies donated to the Foundation from this event will go toward increasing the number of children supported in Thailand and Cambodia.